Protect the environment and reducing your costs for solvents and its disposal! SmartSaver recycler saves up to 90% of mobile phase by redirection of the pure solvent to the solvent reservoir during the isocratic HPLC. SmartSaver brings quite new approach to solvent recycler design. 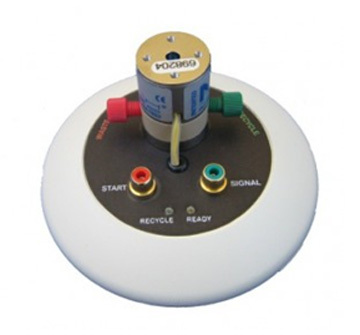 Very compact instrument is powered directly from chromatography data system PC, no power adapter is required. User friendly software is provided to configure the parameters, and to perform on-line monitoring/audit trail. Analog input allows unipolar or bipolar operation within range of ± 1V. 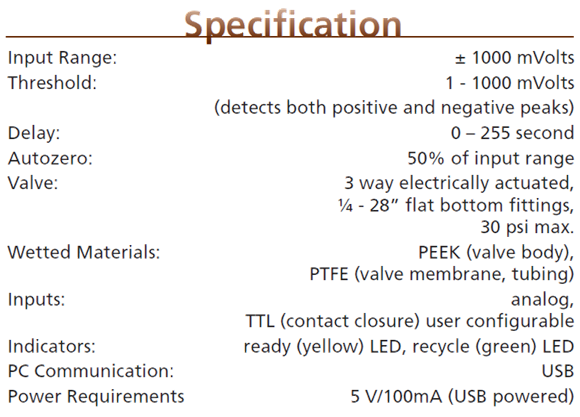 TTL/contact closure can be configured as start, auto-zero or valve position control input. SmartSaver continuously monitors output signal of the chromatographic detector. Analog-to-digital converter produces digital data for further evaluation in build-in processor. If the input signal level exceeds the preset value (threshold), SmartSaver redi-rects the flow to the waste, respecting the transport time from detector to the switching valve. When signal goes down SmartSaver is waiting for transport delay again and then switch the mobile phase back to the reservoir. Autosampler injection marker connected to the SmartSaver may ensure the zeroing of signal input at the moment of injection. Part Number: KIT-460010 / Price on request.